1) I have size 13 feet. 2) I was the only kid in my schools history who played 1st XV rugby, 1st XI Cricket and 1st XI Soccer. 4) I won a competition at a nightclub for being the best dancer. 6) My best cricket return, bowling in a match, was 10-48. Yes Tom I am a better bowler than you. You know who you are. 7) I have held the William Webb Ellis (Rugby World Cup) trophy aloft, and waved it around. 8) I can’t stand blue cheese and prefer a cold beer to Champagne. 9) My first ancestor to arrive in New Zealand, was Sir Walter Scott’s nieces son. 10) At age 19 I could run 100 metres faster than my older brother who was a proper athlete. 11) My Grandfather was the first All Black sent off in a game of rugby in South Africa. 12) I was once married into the British Royal Family. 13) I know about passing the port to the left, I learned it the hard way. 14) I’ve bowled an over at a West Indian Test Batsman. He hit me for 6, five out of six deliveries. 15) I wrote a public statement to the people of New Zealand for one of our greatest heroes to sign his name to. 16) I didn’t ‘graduate’ from High School, I was asked to leave. 17) I’ve been interviewed on TV by BBC South Today, TVNZ and NBC. 18) I wrote a play for a competition when I was 12 years old which featured on a New Zealand television show. 19) I have a shark phobia, (or just a natural fear of a dangerous predator). 21) I was in the New Zealand army and also spent a year in the ready reaction force. 22) My Great-Great-Grandfather was asked by Te Kooti to be with him at his deathbed. 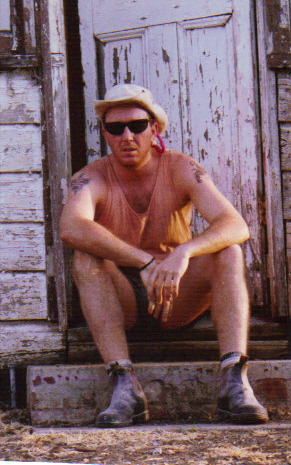 23) I had driven over 200,000 kilometres by the age of 19, mostly in trucks and Land Rovers. 24) I was 12 when I learned to ride a motorbike. 25) My paternal grandmother used to wash the family laundry in a stream as the family lived in a corrugated iron shack with no running water. hey sandy, blogging is way better than facebook. i use intense debate for comments, it helps keep the conversations going and in some sort of order, check it out i recommend it. Blimey, did you have the punctuation checked first? You’re all over the place, Sandy old chap. You may have seen the earlier bit in my ‘who is sandysviews’ about how I didn’t pay any attention at school. I failed English. I have no idea where to put punctuation properly. I don’t know all sorts of stuff about proper English. As you can see.